Discover Scuba Diving / Try Diving, like the name says, is an introduction to diving. 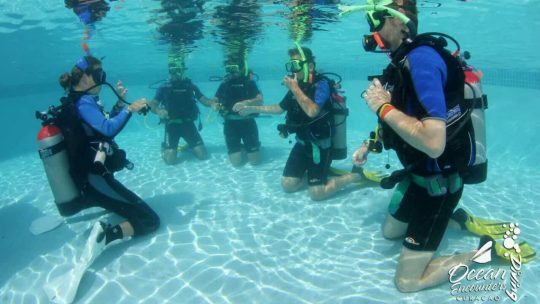 Our Scuba Encounter program is available for certified and non-certified divers. No dive experience needed. This introductory diving course counts towards your Open Water Diver certification and is all you need to dive with dolphins! Yes, even non-certified-divers can dive with dolphins after following this program. You can also combine the DSD with an Animal Encounter or even a dolphin dive. Yes, even non-certified-divers can dive with dolphins after following this program. And we offer photo and video service of your experience with our partner Turtle & Ray Productions. I’m not a good swimmer can I dive? You don’t have to be a great swimmer, but you have to be able to swim. Mask/Snorkel, Fins, Wetsuit, BCD & Regulator. Normally $45/day, now..
Video of your dive, price on request; reserve in advance to guarantee videographer.